Click the image below to view the 2018 program. We are proud to be celebrating the eighteenth annual Controversies and Advances in the Treatment of Cardiovascular Disease symposium! The two-day scientific program will offer realistic views on many controversial issues in cardiovascular disease today. Sessions will include a combination of lectures, debates, and discussions. A faculty of internationally known leaders has been invited to share their knowledge and experiences with complex and controversial cases. This conference is designed for cardiologists, cardiovascular and thoracic surgeons, interventional cardiologists, perfusionists, ICU nurses, technicians and those involved in the diagnosis, treatment and care of individuals with controversial and complex cases of cardiac disease. If no CME/CEU credit is needed, you may register as a complimentary attendee using the complimentary registration form. 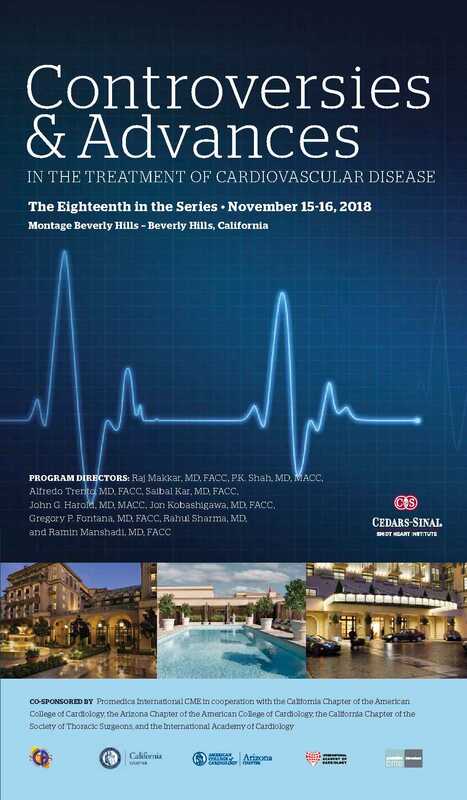 To receive CME/CEU credit for attending the symposium, you must pay the reduced fee of $150 for Cedars-Sinai employees. You can pay for your registration online. Promedica International designates this live activity for a maximum of 16 AMA PRA Category 1 Credit(s)™. Physicians should claim only the credit commensurate with the extent of their participation in the activity. Successful completion of this CME activity, which includes participation in the evaluation component, enables the participant to earn up to 15.25 Medical Knowledge MOC points and Patient Safety MOC credits in the American Board of Internal Medicine’s (ABIM) Maintenance of Certification (MOC) program. Participants will earn MOC points equivalent to the amount of CME credits claimed for the activity. It is the CME activity provider’s responsibility to submit participant completion information to ACCME for the purpose of granting ABIM MOC credit. The Montage Beverly Hills is currently sold out for November 12-14. If you are looking to reserve a room, please contact Rebecca Law to check for current availability and pricing. All cancellations must be submitted in writing and refunds will be subject to a $100 administration charge. Cancellations cannot be accepted over the telephone. Requests for cancellation must be submitted no less than 45 days from the conference date.